I recently bought a Microsoft Zune which I am very pleased with. It allows me to watch movies and listen to music on boring train journeys. If you have an Xbox 360, you can plug your Zune into the Xbox via USB and watch the movies or listen to music thorugh your TV. I just found this really cool site: http://www.startdoingmore.com/. It shows various Microsoft applications running on Windows Mobile in a really nice graphical manner. It shows a quick example of Live Search, which I have installed on my device awhile back which is really neat. You'll need data access, Wi-Fi or GPRS/UMTS connection for it to work. I have been using http://pinvoke.net/ for quite a while now and thought I'd share this site for anyone who has never come across it before. It allows you to interop with unmanaged code easily by selecting the dll that contains the function you wish to use and the site gives you a C# and sometimes a VB.NET signature of the function. In addition, the site has a directory of how to code the structures, interfaces and enums etc for the unmanged function. The site supports both desktop and devices. I have written some previous articles on GDI about one thing or another in the past, but never mentioned the simple practice of ensuring your code will display correctly under all screen types. Even though the code I have posted contains this practice I have never made a point of it. 1. Declare a constant that defines the points per inch you intend to design your control. In the example below, I have used 96dpi which is a QVGA screen (320x240) which is the majority of devices on the market today. 2. The example below shows the OnPaint method with a simple piece of code that displays "Hello World!" 20 dpi from the left and top edge of the screen. Now try running the above code on a VGA and QVGA device, you'll see the position will be proportional to the screen size. This technique becomes very handy when the positioning is very important such as owner drawn lists etc. I want to start a regular blog regarding the books that I read and to give feedback as to what I think of the book and whether I recommend it to others. As most of you are probably aware now that .NET 3.0 has been released - formally known as WinFX in the early pre-beta days last year. But my guess is probably most shops are not using .NET 3.0 yet. Would like to hear feedback from anyone on this, experiences etc. Part of .NET 3.0 is WCF - Windows Communication Foundation - formally known as Indigo. Indigo is a new set of API's that build ontop of other messaging technologies, such as Enterprise Services (COM+), Web Services, MSMQ, Windows Services (NT Services), .NET Remoting. But WCF is much easier than all these and massively flexible. I highly recommend this book. It starts by going back to fundamentals and talks about SOA's. If you're not sure what an SOA is, then this book should clear things up for you. 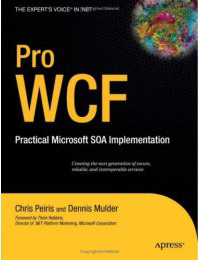 The book is highly technical and covers WCF to a fairly good degree. You will certainly learn enough in order to be productive in WCF once you have read this book. The WCF fundamentals are covered throughout the book with constant examples which are the ABC's of WCF - Address, Binding and Contract. The book covers most types of bindings - ones which come with WCF which to be honest is probebly more than enough. I like the easy reading layout, the author's writing style encourages you to read more and more rather than to put the book down. My company will be an exhibitor at the coming Service Management Europe show at the famous NEC centre in Birmingham, England Oct 24th - 25th 2007. Service Management Europe is an event that dedicated to the ever growing field service market. This market consists of maximizing return and reducing costs by the use of mobile technology. My company name is: Enton Consulting and Technology who specialize in mobile technology: http://www.servicemanagement.co.uk/enton-consulting-and-technology-.html. We will be on stand 542. We will be demonstrating our latest offerings plus we will have a speaker from one of our major clients that we are working with and he will be talking how our solutions have reduced his business costs, made his business more efficient and made his whole operation more profitable. See here for more information: http://www.servicemanagement.co.uk/. You can be sure to see me at the Global Summit in Redmond April 2008!